A light bulb held by the magician lights at his command. You can use the bulb to find a forced or marked card, you can use it to ask questions and turn it on when they answer "yes" and off to the "no ", you can use it as a gag putting it on the head, etc.. Use your fantasy. 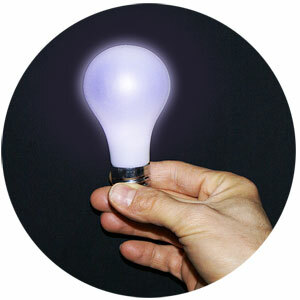 - It is 11.5 cm long and the bulb has a diameter of about 6 cm. - This model allows you to change the battery, once discharged.